Cat. Cactees 8 (1858), nomen; Bois, Dict. Hort. 471 (1896), in syn. Accepted Scientific Name: Echinopsis huotii (F.Cels) Labour. Monogr. Cact. 301, 1853 Labour. Origin and Habitat: Echinopsis huotii is common in the Bolivian department of Cochabamba, Santa Cruz, Chuquisaca and Tarija. Altitude range: 1900-2800 meters above sea level. Habiat and ecology: This species dwells on rocky slopes. Description: Echinopsis huotii is a subcylindrical cactus species, solitary at first, later branching basally to form small clumps. The pure white flowers, which last only about 24 hours, are up to 14 cm high and sweetly scented. Two subspecies are recognized, the nominate form and subs. vallegrandensis. Derivation of specific name: The epithet 'huotii' has been bestowed in honour of Mr. Huot, cactus horticulturist working in the Monville collection. Stems: Globose to subcylindrical, erect, suckering at the base, pale to dark green, to 35 cm tall, and 8 cm in diameter. Ribs: 9-10(-11), swollen around the areoles, furrows deep to 1.2 cm high. Areoles: Prominent wider than long, at first with long yellowish white tomentum, then ash-grey. Central spines: 4, awl shaped, forming a crucifix shape, the lowermost 3 near equal, the uppermost one conspicuously longer, to 4 cm long, very stiff, brown becoming ash-grey as they age. Radial spines: 9-11, needle-like, divergent, radiating, to 2 cm long unequal, the uppermost the shorter. All spines with black tips. Flowers: Borne laterally, white, 17-20 cm long, scented. Similar species: Echinopsis huotii is strictly related to Echinopsis bridgesii and often considered merely a local variant of the latter (if not the same). Echinopsis huotii (F.Cels) Labour. : (subsp. huotii) tends to be cylindrical, with 4 central spines. Distribution: Bolivia (department of Cochabamba, Santa Cruz, Chuquisaca and Tarija). Echinopsis huotii subs. vallegrandensis (Cárdenas) G.Navarro: tends to be globose, rarely exceeding 9 cm in height, with only one central spine. Distribution: it is restricted to Vallegrande province. 5) Portefeuille des Horticulteurs. Journal Pratique des Jardin. Volume 1, page 216, Paris 1847. 6) J. Labouret “Monographie de la Famille des Cactees”. Dusacq, Paris 1853. 7) Martin Cárdenas “Nouvelles Cactées Boliviennes”. Part. VI Sect 1. In: Cactus. 14(65): 163.Paris 1959. 8) Gonzalo Navarro “Catálago ecológico preliminar de las cactáceas de Bolivia”. In: Lazaroa. 17: 50, 1996. 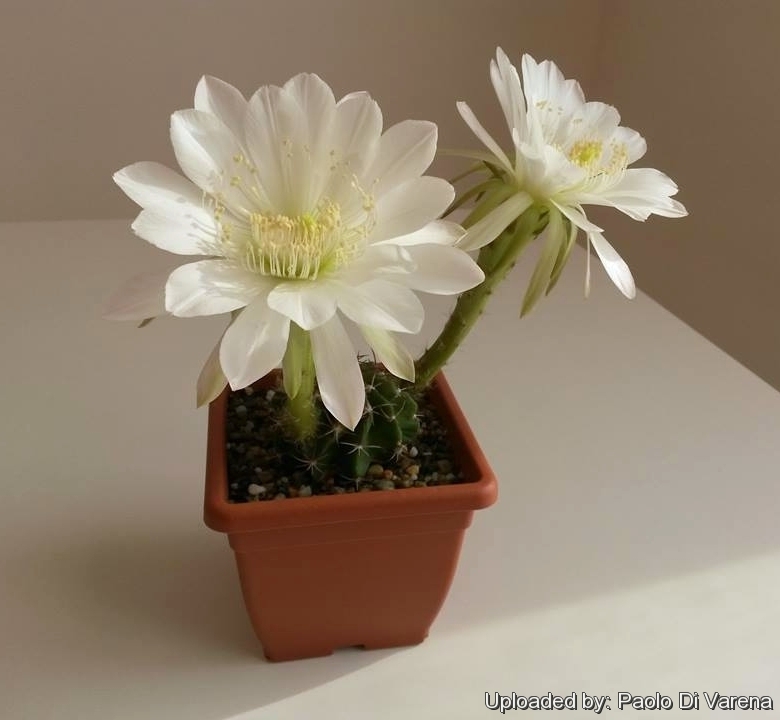 Cultivation and Propagation: Echinopsis huotii is a summer grower species that offers no cultivation difficulties. Water regularly in summer (but do not overwater ) needs good drainage and very porous soil, keep rather dry in winter. Feed with a high potassium fertilizer in summer. It is quite frost resistant if kept dry (hardy to -10° C). Need a bright exposure, full sun or half shade in summer.